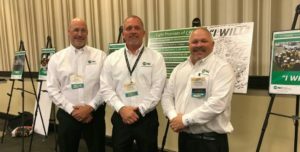 The North Carolina Association of Electric Cooperatives’ Job Training & Safety (JT&S) team was one of 20 organizations nationally selected to present at the National Rural Electric Cooperative Association’s (NRECA) 2018 Safety Summit held recently in Atlanta. JT&S used the opportunity to bring national attention to its “I WILL” safety initiative, which aims to make safety personal, create an emotional impact and emphasize personal accountability every day. The program was developed to address the rise in contacts and serious injuries in the state, which was following the national rising trend. The program was to address the question “What are we going to do about it?” The JT&S team’s strategy became a purpose to make safety personal. Eight safety promises were created to build the foundation of the program. Each safety promise begins with the simple but powerful words “I WILL,” which equate to a personal commitment of positive action. Each promise contains an action word such as accountable, focus, family and engage. These words together provide guidance to make the right decision daily. (Left to right) Don Gatton, Chris Walker and Farris Leonard at the 2018 Safety Leadership Summit in Atlanta.